The House Republican tax reform plan would reform the individual income tax and would move towards destination-based cash flow taxation of businesses. According to the Tax Foundation’s Taxes and Growth Model, the plan would significantly reduce marginal tax rates and the cost of capital, which would lead to 9.1 percent higher GDP over the long term, 7.7 percent higher wages, and an additional 1.7 million full-time equivalent jobs. The plan would reduce federal revenue by $2.4 trillion over the first decade on a static basis. However, due to the larger economy and the broader tax base, the plan would reduce revenue by $191 billion over the first decade. Although the plan would reduce federal revenue by $2.4 trillion on a static basis in the first decade, much of the revenue loss is one-time. As a result, the plan will cost much less in subsequent decades. On a static basis, the plan would lead to 0.7 percent higher after-tax income for all taxpayers and 5.3 percent higher after-tax income for the top 1 percent. When accounting for the increased GDP, after-tax incomes of all taxpayers would increase by at least 8.4 percent. In June, the House Republicans released a tax reform plan. The plan would reform the individual income tax code by lowering marginal tax rates on wage, investment, and business income; broaden the tax base; and simplify the tax code. The plan would also lower the corporate income tax rate to 20 percent and convert it into a destination-based cash-flow tax. Finally, the plan would eliminate federal estate and gift taxes. Consolidates the current seven tax brackets into three, with rates of 12 percent, 25 percent, and 33 percent (Table 1). Taxes capital gains and dividends as ordinary income and provides a 50 percent exclusion of capital gains, dividends, and interest income. This is equivalent to taxing capital gains, dividends, and interest income at half the rate of ordinary income, with three brackets of 6 percent, 12.5 percent, and 16.5 percent (Table 2). Eliminates the personal exemption and creates a $500 non-refundable credit for dependents who are not children. Increases the Child Tax Credit to $1,500 per child, limits the refundability of the credit to $1,000, and raises the phaseout threshold for the Child Tax Credit for married households from $110,000 to $150,000. Modifies all business income taxes to be border-adjustable, disallowing the deduction for purchases from nonresidents and exempting export profits and foreign-derived profits from taxation. According to the Tax Foundation’s Taxes and Growth Model, the House Republican tax plan would increase the long-run size of the economy by 9.1 percent (Table 3). The larger economy would result in 7.7 percent higher wages and a 28.3 percent larger capital stock. The plan would also result in 1.7 million more full-time equivalent jobs. The larger economy and higher wages are due chiefly to the significantly lower cost of capital under the proposal, which is due to the lower corporate income tax rate and the full expensing of capital investment. If fully enacted, the proposal would reduce federal revenue by $2.4 trillion over the next decade on a static basis (Table 4). The plan would reduce individual income tax revenue by $981 billion over the next decade. Corporate tax revenue would fall by $1.2 trillion. The remainder of the revenue loss would be due to the repeal of estate and gift taxes. On a dynamic basis, the plan would reduce federal revenue by $191 billion over the next decade. The larger economy would boost wages and thus broaden both the income and payroll tax base. As a result, the federal government would see $566 billion in additional individual income tax revenue and $683 billion in additional payroll tax revenue. On the other hand, corporate income tax revenue would actually decline even more on a dynamic basis. This is because the plan would encourage more investment and result in businesses deducting more capital investments, which would reduce corporate taxable income. The House Republican tax plan contains a number of significant base broadeners. Eliminating all itemized deductions except for the mortgage interest deduction and the charitable deduction would significantly broaden the income tax base and raise about $2.3 trillion over the next decade. In addition, the plan would eliminate most individual credits, except for the Child Tax Credit, the Earned Income Tax Credit, and the American Opportunity Tax Credit. This would raise an additional $104 billion over the next decade. Expanding the standard deduction, replacing the personal exemption with a dependent credit, and expanding the Child Tax Credit would reduce revenue slightly ($127 billion over the next decade). On the business side, there are two significant base broadeners. The elimination of the interest deduction would raise $1.2 trillion over the next decade. In addition, making business taxes border-adjustable would raise another $1.1 trillion over the next decade. The elimination of business credits and deductions and the limit on net operating losses would bring in an additional $701 billion over the next decade. The largest sources of revenue loss in the first decade would be the individual and corporate rate cuts and the move to full expensing of capital investments. Reducing individual income tax brackets to 12, 25, and 33 percent would reduce revenue by about $2 trillion over the next decade, while cutting the corporate income tax to 20 percent would reduce revenue by $1.8 trillion over the next decade. Capping the tax rate on pass-through businesses would reduce revenue by $515 billion (after accounting for the new, lower tax brackets). Full expensing of capital investment would reduce revenue by $2.2 trillion over the next decade. 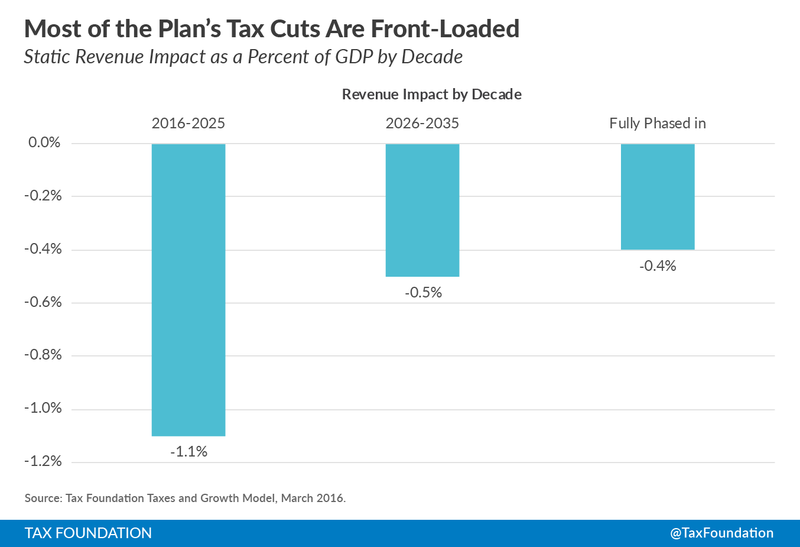 Although the plan will reduce federal revenues by $2.4 trillion over the next 10 years, much of the cost is due to transitional, or one-time, revenue losses that disappear eventually. 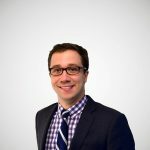 There are two provisions that contribute significantly to these transitional costs: full expensing of capital investments and the elimination of the interest deduction. As stated above, moving to the full expensing of capital investments would reduce federal revenue by $2.2 trillion over the next decade. There are two revenue impacts from moving to expensing. First, businesses will be allowed to fully write off investment costs the first year. This speedup of cost recovery increases the present value of cost recovery and reduces federal revenue each year. Second, after full expensing is enacted, businesses will continue to write off investments they made under the old depreciation regime. When businesses fully write off new investments and continue to write off old investments, corporate taxable income falls significantly in those years, greatly reducing corporate revenue. However, once old depreciation has expired, the annual cost of expensing drops. The plan also eliminates the deduction for net interest payments by businesses. We assumed that this provision would be prospective, or it would only apply to interest on loans made after the proposal went into effect. As a result, businesses would continue to deduct interest from loans acquired before enactment of the plan, reducing the amount of revenue this provision would raise in the first decade. In later decades, as old debt is retired, more interest would no longer be deductible, resulting in more revenue. The plan also has one transitional revenue raiser: deemed repatriation. This proposal would tax corporations on their current deferred offshore profits. We assume that this provision would only raise revenue in the first 10 years. As a result of these transitional issues, the plan would cost much less in subsequent decades. We estimate that the proposal would reduce federal revenue by 1.1 percent of GDP in the first decade, 0.5 percent of GDP in the second decade, and 0.4 percent of GDP after all transition costs have phased out. 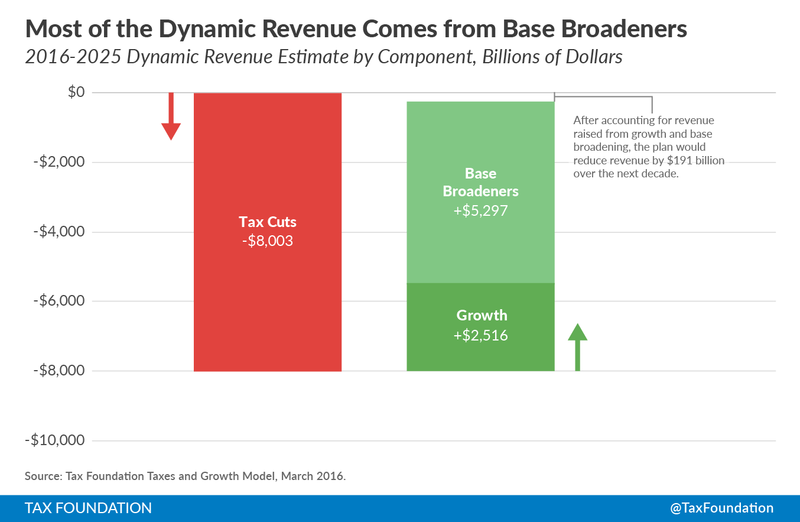 The dynamic revenue impact of -$191 billion over the next decade can be broken down into three pieces: the marginal tax cuts, growth, and the base broadeners. The first piece is the marginal tax rate reductions in the plan. These provisions include, but are not limited to, the cut in the corporate income tax rate to 20 percent, full expensing of capital investments, and the reduction in marginal tax rates for most individuals. Combined, these tax cuts would reduce federal revenue by $8 trillion over the next decade if enacted alone. The second piece is the expected increase in revenue due to economic growth. As stated previously, this plan would reduce marginal tax rates on work, saving, and investment. Our model finds that these marginal tax rates would significantly increase the long-run size of the economy. The larger economy would boost wages and thus increase the tax base, especially for the individual income and payroll taxes. As a result, the growth from the plan would reduce the 10-year cost of the plan by roughly $2.5 trillion. The third and final piece is the base broadeners in the plan. The House Republican tax plan contains a number of significant base-broadening provisions, such as the elimination of most itemized deductions, the elimination of the deduction for net interest expenses for businesses, and the border adjustment of businesses taxes. Combined, these provisions significantly broaden the tax base and reduce the revenue loss of the tax plan by $5.3 trillion over the next decade. On a static basis, the House Republican tax plan would increase the after-tax incomes of taxpayers in every income group. The bottom 80 percent of taxpayers (those in the bottom four quintiles) would see a small increase in after-tax income between 0.2 percent and 0.5 percent. Taxpayers in the top 10 percent would see a 1 percent increase in after-tax income. Taxpayers in the top 1 percent would see the largest increase in after-tax income on a static basis of 5.3 percent, driven by both the lower top marginal tax rate and the lower corporate income tax. On a dynamic basis, all taxpayers would see an increase in after-tax income of at least 8.4 percent. The top 1 percent of taxpayers would see an increase in after-tax income of 13 percent on a dynamic basis. We modeled all provisions outlined above and assumed that all provisions were enacted in the beginning of 2016. We accounted for potential transitional costs: most notably, the transition costs associated with moving to full expensing and the phase-in of the elimination of the interest deduction. Both the static and dynamic revenue impacts of the plan are relative to the CBO’s current law baseline. We assumed that Treasury would design anti-abuse provisions that would be successful in preventing individuals from reclassifying a significant amount of wage compensation as business income in order to benefit from the special 25 percent tax rate of pass-through income. In modeling the distributional impact of the plan we followed the convention that changes to the corporate income tax are passed to capital and labor. We assumed on a static basis that 30 percent of the corporate tax change is passed to labor and 70 percent is passed to capital. On a dynamic basis, changes to the corporate income tax falls on capital and labor in proportion to their share of factor income: roughly 70 percent labor and 30 percent capital. We did not model the impact of changes to tax policy associated with the House Republican healthcare reform plan, which contains provisions that will impact tax revenue. The House Republican tax plan also mentions that it would reform the home mortgage interest deduction and the charitable deduction. However, without further details, we assumed that these provisions would be left alone. These revenue numbers are calculated assuming that the individual and corporate tax bases have already been broadened.